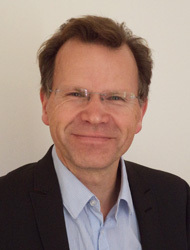 Jochen Roper is Professor of Neurophysiology at the University Medical Center of Goethe University Frankfurt am Main. He is a member of the Rhine-Main Neuroscience Network (rmn²) and the CRC 1080 "Molecular and Cellular Mechanisms of Neural Homeostasis". With his pioneering research into dopaminergic neurons in the central cortex, he decisively contributed to our understanding of neurological and neuro-psychiatric diseases. Together with his colleagues at the Focus Program Translational Neurosciences (FTN), Roeper will conduct disease-related studies of the dopamine system in order to find out more about important brain functions.